I started out consulting for an orthopedic company, and in turn bought a shop with a few CNC machines. The facility was using another CAD/CAM system at the time, so I learned the program to take care of jobs that needed to be done. We closed the deal on this shop at the end of 2000, and really got things going in January of 2001. I had run CNC machines for a long time, but had never programmed before. There was one job that I remember in particular that was a complex 3D part with multiple contours, and the current CAD/CAM system in place could only take me so far, which wasn't even close to where I needed to be to make this part. Prior to taking on this job, one of OneCNC’s representatives had called to tell me about their software applications. Once I knew that my current system would not be able to program this part, I decided to give OneCNC a call back. When I spoke to their technical support representative, sent over the file, the response was “"Oh this is no problem". This was back when OneCNC had their 2000 series system, their first version. The support representative and I programmed the part together, we stayed on the phone for a couple of hours and he walked me through how to do one side of it in OneCNC, I did the other, and the part turned out great…and that was really the beginning. 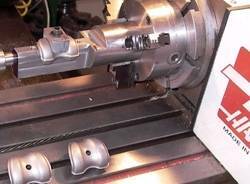 Getting rid of the other CAD/CAM system and switching to OneCNC really took me away from being a small time, mom and pop job shop; it literally was the turning point. Once we made the investment in OneCNC, it really put me in the league with the big players. When I worked with the orthopedics company, I had experience with Unigraphics and I was pretty surprised at how close this $3500.00 package, at the time, got me to UG which was close to $50,000.00 for everything we needed. Honestly, it didn't have everything UG had in terms of some high end modeling and blue print capabilities, but I didn't need that. I am not a blue print shop, I'm a machine shop. OneCNC did everything I needed it to do very nicely and very accurately. The majority of my customer base is orthopaedic companies, University of Medicine and Dentistry of New Jersey Orthopedics and Dental departments. Right now we are doing a lot of parts with complex contours i.e. knees, hips, clam shell molds, prime shell fixtures for hips, etc. Up until last year, we had been a prototype shop-not a lot of high production. One of our new customers had numerous high quantity jobs. OneCNC has really helped out in the transition from prototyping to high quantity jobs. I haven't found a part yet that OneCNC couldn't handle in terms of designing and tool path generation. For example, I had one part that required hand work, which I don’t do here at my facility; it was a good IGES file that I had no issues with within OneCNC. I sent the file over to an EDM shop that uses MasterCAM, and they couldn't even open it, I had to send them blue prints. And, here I have received and programmed many of this customer's files with OneCNC with no problems. In all, the original small shop is now running 4 Haas Mills, 1 Kitamura, 2 Milltronics, and 5 manual machines, with new machines on order. I have upgraded to every OneCNC version that has been released, and just recently added the new XR2 4th Axis module to my XR2 Mill Expert system. In 5 years of ownership and use, OneCNC has never let me down. Precise Components & Tool Design, Inc.